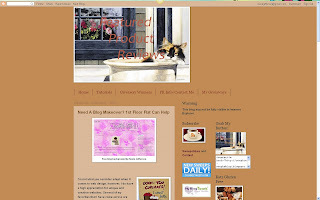 Well folks, I'm covered with blushes: an unsolicited review on Featured Product Reviews blog. And she says such nice things! Thank you so much Millie - this just makes me want to try even harder! Congratulations to a well-deserved pat on the back. Congratulations, Susie...You've been VIEWED so many times by all of us here in Blogland with your Helpful VIEWS and Tips. It's way past time for 1st Floor Flat to get a BIG REVIEW! I'm on my way to check it out! Thanks so much Susie for posting the link. I must say you REALLY underestimate yourself! "Millie" is actually my alias. Congratulations and well deserved. If ever I have a problem (and this happens a lot) I turn to you for the answer. If it is not there I email you and you always reply.